The Mega Moolah online casino slot machine from Microgaming revolves around a four jackpot system that is responsible for numerous life-changing payouts. It is a unique, simple and fun themed pokies game for both casual and high rollers, that has been a successful game since its release. This action-packed, safari themed pokies title is the Millionaire Maker, offering amazing opportunities for New Zealand players to become instant millionaires overnight with its massive $1,000,000 plus jackpots. Max Jackpot in Coins (for one payline): Base Game: 75,000 Coins, Free Spins: 225,000 Coins. 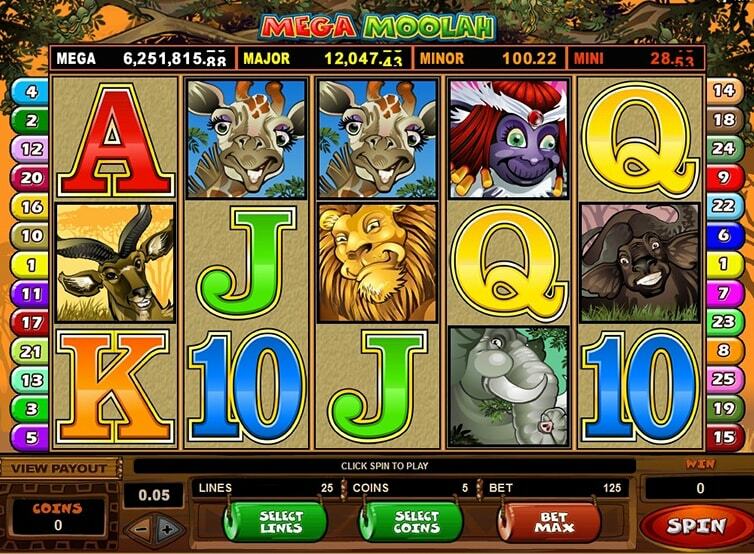 Microgaming’s Mega Moolah online casino pokies game is an African Safari based progressive five-reel slot that has 25 paylines and three rows. With a minimum wager from as small as $0.01, you can win huge amounts of real money. You can also bet the maximum of 125 coins on a single spin, which would be a total of $6.25. The maximum wager is perfect for players who aren’t in favour of breaking the bank betting large amounts per spin, but still want to try their luck at winning the jackpot. When you get a lion symbol on the reels, you’re in luck since the lion represents the wild symbol of Mega Moolah casino pokies. It will substitute for any other symbols except the scatter to complete a winning combo on an active payline. All your wins are also doubled thanks to the wild lion. When you land five wild lions on an active payline, you can enjoy the reward of a whopping 15,000 credits! In the Mega Moolah pokies game, the scatter symbol is represented by the monkey. The scatter symbol can appear anywhere on the five reels to complete a winning scatter combination with two or more scatters on the reels. When at least three scatter monkey symbols appear, a special bonus Free Spins Game is activated. Players who get at least three Monkey scatters anywhere on the reels unlock the bonus round of Mega Moolah. This bonus feature rewards you with 15 free spins with a 3x multiplier. Any winning combinations during this feature are tripled in value. Moreover, if you spin three or more of the Monkey scatter symbols on a free spin, you can enjoy an additional 15 free spins coming your way. The Mega Moolah pokies attract players across New Zealand in droves thanks to its tempting jackpots. Comparable to Playtech’s Marvel games, Mega Moolah also features not one or two, but an enticing four progressive prizes – from highest to lowest, they are the Mini, Minor, Major and the Mega. The four jackpots can award a minimum prize of $10, $100, $10,000 and $1,000,000 respectively. The Mega Moolah top progressive jackpot is worth a staggering $1 million, and it only grows as people keep playing. Once a player wins the Mega jackpot, the winning amount is reset to a minimum of one million NZ dollars. This progressive jackpot grows at an exponential rate since the wagers of thousands of players playing Mega Moolah every second around the world contribute to it. There is no certain way of triggering the progressive jackpots. It occurs pretty randomly at any time except during the Free Spins Bonus Round. A unique feature of Mega Moolah casino pokies is that you are not required to play a maximum bet to win any of the four jackpots. Based on pure luck, you can get a Jackpot Wheel of Fortune that you have to spin and land on one of the jackpots. The large wheel is divided into segments, with each segment belonging to one of the four different jackpots represented by a unique colour and animal footprints. The Mini Jackpot is represented by red, Minor by orange, Major by yellow and finally the Mega progressive jackpot by white. Take a deep breath, spin the wheel and keep your fingers crossed while the large wheel comes to a halt to reveal your jackpot amount. 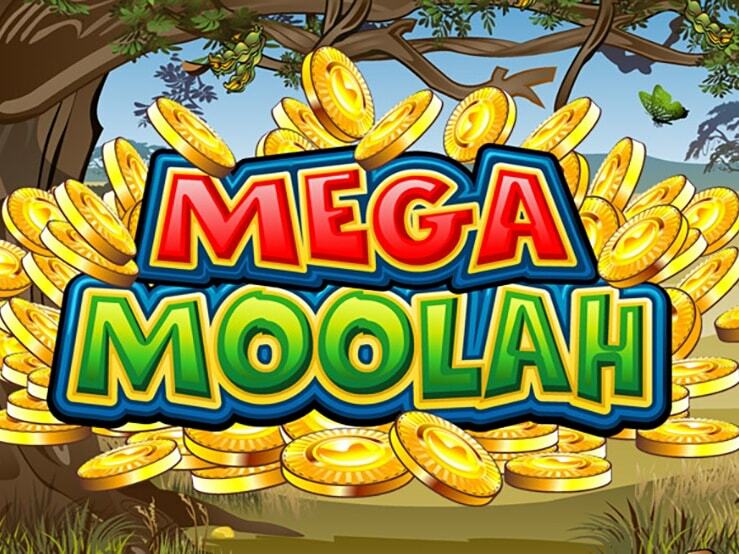 New Zealanders can play the Mega Moolah mobile slot game on almost all smartphones and tablets directly without having to download or install an app. The mobile version of the game provides the same gaming experience as you play on your desktop and laptop. Whether you have an Android, iPad, iPhone, Blackberry or Windows Phone, you can enjoy the same quality graphics, bonus features, and the incredible four-tiered Progressive Jackpot of Mega Moolah at anytime and anywhere. The Mega Moolah online casino pokie isn’t a good game just because of its progressive jackpots. You can still win massive amounts of cash in this pokies game in the regular game you can win a jackpot of 75,000 coins and 225,000 coins in the free spins bonus feature. Mega Moolah is the most loved online slot among internet gamblers in New Zealand thanks to its exciting features, progressive jackpots, thrilling free spins and pleasant graphics. Mega Moolah not only promises a million dollar jackpot, but also strikes a balance with many small wins. At OnlineCasino.co.nz, we have carefully gathered the best real money online casinos after thoughtful review and a great deal of consideration. Each online casino has been tested in terms of players&apos; safety, games management and customer support. We recommend playing Mega Moolah at our listed online casinos so that you can avail the welcome bonus and deposit bonus. Rest assured, you can have a fun-filled and safe gaming experience. Visit the highest rated casino for a NZ$1600 welcome bonus! Which online casinos can I play Mega Moolah at? At Casino Online NZ, we have listed the best online casinos available for New Zealanders to play Mega Moolah slots for real cash. Go through our detailed site reviews and we'll help you choose the top Mega Moolah casino for you. Is Mega Moolah popular in New Zealand? Microgaming&apos;s prominent progressive online pokie, Mega Moolah, is beyond doubt the most frequently played progressive jackpot game among New Zealand punters. How much can I possibly win in Mega Moolah? The Mega Progressive jackpot of Mega Moolah awards you a minimum of $1,000,000 in real money. The other three jackpots offer $10, $100 and $10,000 at the very least. The regular jackpot can pay out 75,000 credits per payline can be achieved during the base game. Besides Mega Moolah, what games are popular? Other popular progressive slots besides Mega Moolah include Microgaming’s The Dark Knight, Net Ent’s Mega Fortune Gods and Playtech’s Marvel Jackpot. The world&apos;s largest internet casino software developer, Microgaming Software Systems Limited developed the Mega Moolah online casino slot, the first ever progressive slot game. Can I safely play Mega Moolah? Our listed, trustworthy casinos offer New Zealand players interested in playing Mega Moolah absolutely safe and secure gameplay.